The Board-Certified Case Manager (CCM) exam is given as a way of measuring an individual’s basic knowledge of case management. Passing the CCM exam shows that you have the necessary knowledge and professionalism to succeed as a case manager. The CCM certification is the first nationally accredited case manager credential. Earning your case manager credential proves that you have the necessary knowledge and expertise to provide services to patients with serious medical conditions. Most Board-Certified Case Managers have backgrounds as Registered Nurses. Other’s have been in case management for over ten years. The purpose of the exam is to determine whether the test taker holds the proper qualifications that a case manager needs to have. Deciding to obtain your case manager certification will have a positive effect on your career and will lead to a higher salary. Having a baccalaureate or graduate degree in a health or human services field. The degree must be from an accredited institution, and the individual looking to be certified must have completed supervised field experience in case management, health, or behavioral health. 12 months of full-time case management employment experience. This experience must have been supervised by a board-certified case manager who has been certified for at least 12 months. 12 months of full-time case management employment experience supervising individuals providing case management services. How can I register to take the exam? Prepare with our CCM Study Guide and Practice Questions. Print or eBook. Guaranteed to raise your score. Get started today! The CCM exam is administered three times a year. In order to register for the exam, you will need to apply online on the official CCM website: https://ccmcertification.org. Keep in mind that you will need to upload a copy of your professional license or certification to your application. Once you complete your application, you will receive your notification of eligibility status. Once you are approved to test, you will also receive your Approval to Test (ATT) in an email. You will not be able to schedule your exam date without your Approval to Test eligibility ID number. There is a fee due at the time of your registration. The application fee is $200 while the exam fee is $185, totaling $385 in all. There is a one-time deferment fee of $85 and a retake fee of $185. Keep in mind that if you are ineligible to sit for the exam, you will be refunded the $185 exam fee. However, all other fees are nonrefundable. If you don’t show up for your exam, then you are considered a “no show” and forfeit all exam fees. Payment must be made by credit card only. Checks and money orders are not acceptable forms of payment. Where will I take the CCM exam? The exam is administered at Prometric testing centers located nationwide. You can schedule your appointment date and time by visiting the Prometric website at www.prometric.com. Your ATT email will contain the contact information for Prometric as well as additional information about how you can schedule your test appointment. Once you schedule your appointment with Prometric, you will receive an email from them confirming your scheduled test appointment. Note that if you are not available to take your exam in the available testing window, you are allowed a one-time deferment to the next testing window for a fee. If you need to reschedule your exam, you must do it on the Prometric website or by calling them at 1-800-899-3985. There is a $25 exam reschedule fee if you reschedule 5-29 days before your scheduled exam, and an $85 late cancellation fee if you cancel 4 days or less prior to your scheduled appointment. What if I am a person with a disability? Will I have proper accommodations? CCM Flashcards. 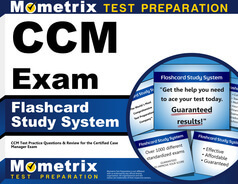 Proven CCM test flashcards raise your score on the CCM test. Guaranteed. Yes. If you are a person with a disability, CCMC and Prometric will do everything they can to accommodate you. You will need to specify that you have a disability on your application. You will also need to submit a written request for special accommodation as well as documentation from a doctor familiar with your disability within 30 days of your application being approved. How is the CCM exam formatted? The CCM exam is computer-based and consists of 180 multiple-choice questions. 30 of these questions are pretest questions and are not scored. The exam is made up of fives domains that are broken down further into subdomains. You will have three hours to complete it. What will the day of the exam be like? On the day of your exam, it is important to arrive at least fifteen minutes early. You will need to have your government-issued photo identification on you and the name must match the name on your application. If you don’t have a valid form of identification with you, you will not be allowed to take the exam. Personal items such as electronics, bags, study material, food, and drinks will not be permitted inside the testing room with you. What score do I need to get in order to pass the CCM exam? 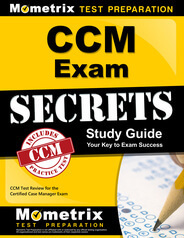 In order to pass the CCM exam, you will need to score at least a 70%. You will be presented with your pass/fail score immediately upon completion of the exam. This immediate pass/fail score is 99% accurate, and you will be able to print it before leaving the exam site. Those who pass the exam will receive their official CCM certificate in the mail. This section of the exam makes up 31% of the exam and consists of 47 questions. You will be tested on topics including, but not limited to adherence to care regimen; case management process and tools; cost containment principles; hospice, palliative, and end-of-life care; coding methodologies; and insurance principles. The psychosocial concepts and support systems section of the exam makes up 27% of the exam and consists of 40 questions. You will be tested on topics including but not limited to behavioral change theories and stages; abuse and neglect; client empowerment; end of life issues; health coaching; psychosocial aspects of chronic illness and disability; and wellness and illness prevention programs, concepts, and strategies. This section makes up 18% of the exam and consists of 27 questions. You will be tested on such things including, but not limited to caseload calculation; program evaluation and research methods; cost-benefit analysis; quality indicators techniques and applications; and data interpretation and reporting. You can expect this section to make up 9% of the exam. It consists of 13 questions and tests you on topics including, but not limited to functional capacity evaluation; rehabilitation post injury, which includes a work injury; assistive devices, including prosthetics, and mobility services; and vocational aspects of chronic illness and disability. This portion makes up 15% of the exam and consists of 23 questions. It will test your knowledge of topics including, but not limited to the Affordable Care Act (ACA); case recording and documentation; privacy and confidentiality; risk management; standards of practice; ethics related to professional practice; and legal and regulatory requirements. I failed the CCM exam. Now what? If you failed your exam, you will be allowed to retake it during the next testing window. However, if you fail the retake exam, you will have to fill out another application and pay the necessary fees. You are required to renew your certification every five years in order to remain current in the case management field. You can start the renewal process by going online to the official CCMC website. Renewing your certification consists of either 80 documented hours of approved continuing education or re-examination. I need a good study resource. Are there any out there? Sure! If you’re looking for a study resource that makes it easy to understand what you’re learning, then Mometrix Test Preparation is an option you definitely want to try. Mometrix has developed a study guide and flashcards that contain only the most relevant information and presents you with practice questions similar to the questions you will run into on the actual exam. The study guide is jam-packed with content that is easy to apply and comprehend while the flashcards are also easy to comprehend and are a convenient way to study on the go. If you want to pass the CCM exam with flying colors on your first attempt, Mometrix is here to help. For more information regarding the CCM test, you can go to the official site Commission for Case Manager Certification. What is the CCM certifcation? CCM certification gives case managers the knowledge and professional experience needed to provide the correct services for patients with various conditions and illnesses. How much does it cost to take the CCM? The application fee for the CCM exam is $200 and the exam fee is $185. How do you become a certified case manager? To become a certified case manager, you need a bachelors or masters degree in nursing, psychology, or some similar field. Previous work experience is often required prior to certification. Is the CCM exam all multiple choice? Yes, the CCM exam contains 180 multiple-choice questions, 150 of which are used to determine your score. How long do you have to take the CCM? Test-takers are given 3 hours to take the CCM exam. How do you sign up for the CCM exam? To sign up for the CCM exam, you need to create a CCMC account. What is the pass rate for the CCM exam? The pass rate for the CCM exam is between 80-85%. What is a passing score for the CCM exam? The scoring system for the CCM exam is very intricate. A “scoring team” will review your exam before coming to a consensus on your final score. You will be given a preliminary pass/fail notification immediately after taking the test.